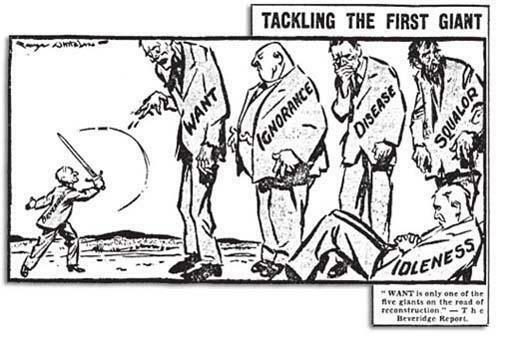 The famous cartoon image of William Beveridge — a diminutive civil servant facing down the Five Giants of Want, Idleness, Squalor, Disease and Ignorance — caught the imagination of a generation in the 1940s and served as the basis of the post-war British welfare state. It also shaped the evolution of social policy as a ‘discipline’ and the work of many in the Social Policy Association over its first 50 years. As a literal poster-child of the welfare state, the idea of ‘our’ William slaying the Goliath of the hitherto intractable problems that had so maimed and destroyed citizens in the past served us well. The logical response has been to try to develop policy strategies to slay them. This has only met with partial success, partly because of a lack of policy continuity and coherence, but also because strategies have failed to seriously challenge and redistribute power. This is because the Five Giants are more symptom than cause of myriad failures within capitalism. Systemic failure within political, economic and social systems causes poverty, disease and the rest. It seems, then, that the idea of slaying the Five Giants may be more of a distraction than a help if the aim is to create greater welfare and wellbeing. To destroy the giants instead requires a fundamental transformation of capitalism itself. This is a tall order and it is difficult to know where to start, but I suggest we begin with the ‘Giant Corporation’, which is in many ways anathema to the principles of welfare. By dominating a particular sector, region or nation, such companies are able to exploit their market positions, workforce and consumers in ways that smaller businesses are not. Whether we focus on pay inequality, workers’ rights or taxation, giant corporations have negative effects. To illustrate this, we could look at large companies that are accused of tax dodging, such as Google or Starbucks. We could examine the retail sector, accused of exploiting labour, including children, in developing-country contexts, as well as food producers, who often produce and package foods in ways that are a detriment to the environment. Then there are the likes of Sports Direct, accused of plumbing new depths of exploitation within their warehouses. But the one giant that probably best captures the nature of the problem highlighted here is Amazon. To begin with, like the banks that tore up the global financial system, Amazon is simply too big. It is too big to resist, too big to compete with and too big to challenge. Jeff Bezos, CEO of the company, is reported to have amassed a net fortune of $137 billion. His current earnings are equivalent to around $215 million per day. In response to criticisms of rates of pay, Amazon agreed in 2018 to increase wages to at least $15 per hour in the US. At this rate of pay, an employee would have to work 24 hours per day for 68 years in order to make what Jeff Bezos makes in one hour. Such wage disparities were not created by modern corporate giants, but the likes of Amazon have helped to reverse a shrinking of the gap between rich and poor within many nations that had begun over the twentieth century. Large and growing economic inequality is what Titmuss referred to in Welfare and Wellbeing as ‘illfare’; it undermines well being, state revenues and even capitalism itself. Despite this, governments and citizens are desperate to entice companies like Amazon to their territories. And as giant corporations expand and force small businesses to close down, cities and regions become more desperate to attract new investors in the hope that they will create new jobs. To entice investors, governments often provide tax incentives, grants, loans or similar incentives that operate to increase the competitive advantage of the large investor vis-à-vis smaller businesses (albeit inadvertently). Citizens, as internet shoppers, may gain something, but as employees, taxpayers, small business owners, property owners and as users of local amenities, they also experience a range of real and intense corporate harms. Giant corporations like Amazon are able to exploit a number of vulnerabilities within nation states. National and regional governments are (usually) desperate to entice inward investment and go to some lengths to do so. With echoes of the offer of other states, the UK sales pitch has been honed over the past three decades: invest in the UK for access to cheap, unregulated and pliant labour alongside unfettered access to European markets. All major companies have to do to unleash a bidding war for their investment is to let it be known that they are ‘available’. Then they sit back and watch the offers come in. Because of its size, Amazon is a company that is able to exploit this to its advantage. Last year, Amazon advertised in North America that it wanted to open a second headquarters. The bidding war that ensued between Canadian provinces and US states eventually secured for Amazon a deal worth some $4.6 billion, according to one estimate put together by GoodJobsFirst a leading authority on corporate subsidies in the US. This is on top of the $1.6 billion effectively given by US federal, state and local governments to the company in tax deals and subsidies since 2012. In the UK, the sums awarded to the company are a little more difficult to gauge, but I have compiled official data which puts the value of direct subsidies at around £20 million. And more are on their way. The full value of additional tax breaks that the company will enjoy as it opens new distribution centres in the UK’s ‘Enterprise Zones’ are, as yet, unknown. But the rent-seeking doesn’t end there. The internet that underpins Amazon’s business model is a complex technology invented by a US taxpayer-funded military programme. Public mail services and taxpayer-funded road, rail and air transportation play a crucial part in its business operations. If you want to see first-hand how your taxes fund Amazon in the UK, take a drive down the publicly-funded ‘Amazon Road’ in Wales. Afterwards, you might greet the taxpayer-funded workers — many of whom rely on working tax credits to bring their wages closer to what citizens need to scrape a living. But forgive them if they are too weary to reply after experiencing the kind of working conditions that a good number have struck against. So while as taxpayers we help to subsidise the likes of Amazon, as consumers we swell the earnings of the richest man on the planet and boost the profits of a company that diverts profits and, accordingly, tax revenues, to senior executives and shareholders. Meanwhile, the small business owner put out of business by the state-backed rigged marketplace that subsidises giant corporations, will find themselves shut-out of a hostile social welfare system. If you want to see this battle play out, visit any high street — or what is left of it. Would cutting the likes of Amazon down to size resolve the injustices and inequities that define contemporary capitalism? Of course not. Bigotry, discrimination, sexism, racism can be made worse by giant corporations, but slaying these would require a range of different weapons. But tackling the system that creates such Giants would at least make it possible to achieve these goals. It would also end the pretence that giant corporations are necessarily part of the solution. Corporate social responsibility, employee discipline and greater levels of social control are all offered up as solutions but inevitably fail since such problems are often the symptoms of flawed and failing economic and business models. The idea that the titans of industry such as Jeff Bezos, Bill Gates and Mark Zuckerberg will save us is not only misguided, the very idea is part of the problem. Massive levels of inequality, job insecurity, poverty wages, exploitation, family-unfriendly modes of working and stressful working environments are considered to be totally unrelated. So what is the answer? Simply closing giant corporations down wouldn’t be the answer in the short term because that would risk plunging communities into hardships from which they would struggle to recover. Too much damage has already been done. We need to tackle the system of corporate welfare that helps to fund and empower giant corporations to the extent that they ultimately become more powerful than the nation states themselves. If we simply slew Amazon without transforming this system, we would end up replacing one harmful and parasitic company with another. Indiscriminately cutting corporate welfare is also not the answer. Some of the £93bn that goes to companies in grants, subsidies and tax breaks, also brings benefits to citizens. Instead, we should use it alongside social welfare to help redistribute resources to poorer communities. This could include more resources to boost social enterprises, grow small businesses, increase opportunities and redistribute work, alongside income and wealth, in order to rebuild left-behind communities. This will be even more important as the UK Brexits — given that EU money that previously went to poorer regions will dry up. Social policies have to be viewed alongside industrial policies, tax policies, transport policies, and workplace and consumer protections in the regulatory sphere. And corporate welfare — in all its forms — should be the one part of the welfare state that is underpinned by conditionality. A company that dodges taxes or treats workers unfairly should be barred from contracting with the state and making any further claims on taxpayers. Social policy needs to focus on the bigger welfare picture and adopt a ‘whole economy’ approach. (See Farnsworth, K. 2019 ‘Towards a Whole Economy of the Welfare State’, Social Policy Review, forthcoming.) Poor working conditions, low pay, unfair taxation systems, corporate tax dodging, corporate subsidies, environmental harm, workers made sick by profiteering bosses, expensive transport systems, harmful commodities and crime-ridden, skeletal town centres are all social policy issues. They should be at the forefront of social policy as a subject. In the meantime, corporate giants grow ever-larger. And with that, so does the potential harm that they do. The social and economic costs that have grown hand-in-hand with the giant corporation are more than the hollowed-out tax and welfare system can cope with. The same corporations that demand so much from the state for themselves actively undermine the tax system that funds them. They also fight the very regulations that might protect their workers or consumers because such policies risk undermining their profits. The giant corporation undermines welfare and it undermines the welfare state. There are signs that some states are fighting back, but others are still all too willing to roll over for the giants. Amazon cancelled a deal with New York to build its second headquarters there after activists, union leaders and some lawmakers objected to the $3 billion in corporate welfare granted to the company. Now, Amazon is moving forward in Virginia, with a combined offer of $1.23 billion in direct and indirect incentives from state and county sources. There are also some solutions that governments such as the UK should consider. The government should tighten regulations on monopolies and anti-competitiveness practices. Some governments recognised the need to break up the banks after they became too big to fail and similar principles should be applied to industrial, retail and web-based giants. An absence of such regulation doesn’t simply allow giants to emerge; corporate giants are only possible because public policies aid and protect them. Recipients of corporate welfare should be subject to the same kind of transparency, scrutiny and conditionality that exists in the social welfare sphere. Such conditionality could include forcing companies to sign up to enforceable contracts that impose penalties if they breach the conditions laid out. Profitable companies that draw down on government-backed loans shouldn’t be able to simply walk away, especially when they make record profits. Companies that dodge taxes should be shut out of public procurement contracts. Ineffective corporate tax breaks should be reined in. And corporate giants should be forced to pay the real living wage rather than having their wage bills effectively subsidised by taxpayers. As Ed Miliband put it when he was leader of the Labour Party, we need to foster corporate producers and defeat the predators. Most importantly, the giant corporation has to be cut down to size. Kevin Farnsworth is a Reader in Social Policy at the University of York. He also founded and maintains Corporate Welfare Watch. He has published widely on the broader issues of political economy and the welfare state, including on corporate welfare, economic crisis, and austerity. He tweets @Dr_K_Farnsworth. With huge thanks to Zoë Irving and Nicki Lisa Cole for helpful and insightful comments on an earlier draft.